I am finally getting around to posting this amazing meal. For Christmas Eve dinner my family enjoyed a small plates appetizer dinner. My Mom and I decided on the recipes and coordinated the plates/shooters/bowls we wanted to use. Yes we used a lot of plates but it was fun for a special occasion. My family does a great job at pitching in and creating meals together. I cherish the time we spend together cooking and feasting. For the miniature Caprese salads we were inspired by this recipe (scroll down) but did not really use it as we have made Caprese salad many times. My husband made the salads for this meal. We used this recipe for the stuffed baguette but did two versions, one with olives and one without (my husband does not like olives). My Mom made this recipe. My Dad made his famous stuffed mushrooms. They are always a hit at parties. Too bad that I don’t like mushrooms. 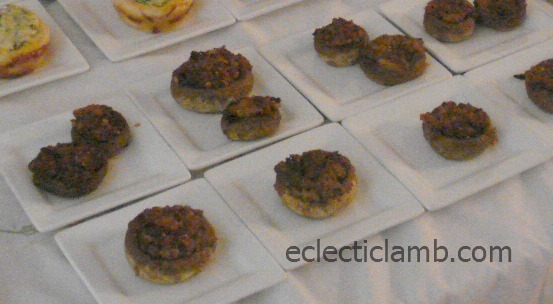 We used this recipe for these delicious morsels. My Mom made these. I made these Pesto Poppers. They were very easy to assemble. 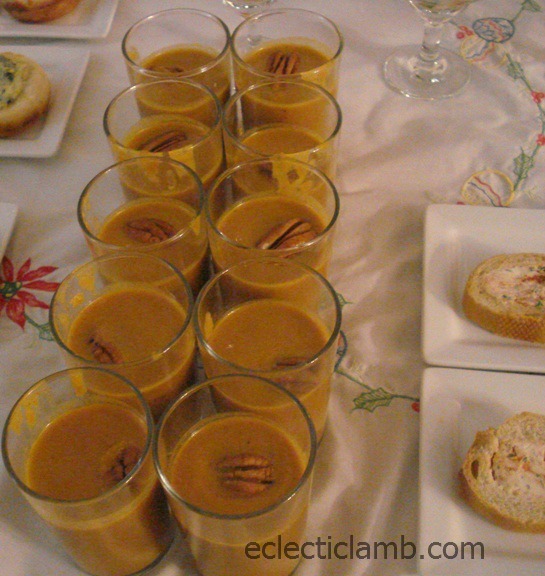 I made these Pumpkin soup shooters. I used vegetable stock. We knew that we wanted to use Asian spoons to add more interest to the table. I found this recipe. It was easy and tasted great! 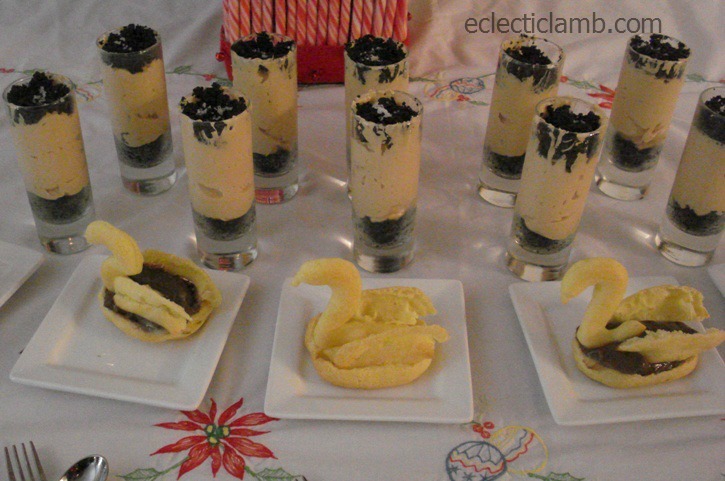 My Mom and husband made the Peanut Butter Pie Shooters. 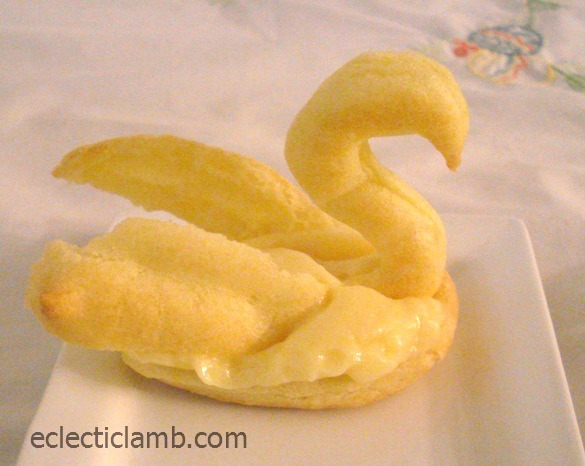 My Mom and brother made the Cream Puff Swans. I supplied them the recipes/directions from this and this. 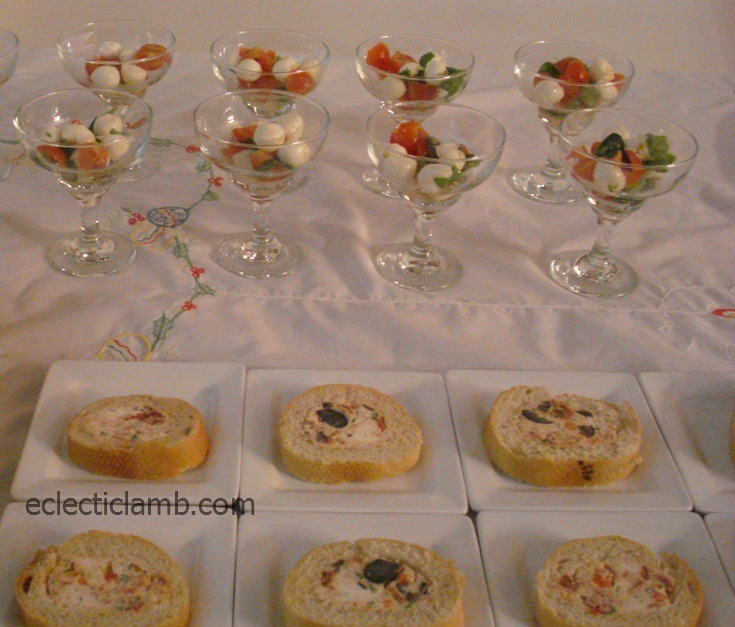 This entry was posted in Food, Party Planning and tagged appetizer dinner, hors d'oeuvres, tasting dinner, tasting party, vegetarian. Bookmark the permalink. Such great, unusual idea. Christmas Eve….. just amazing! Thank you! I will tell them. Wow! Everything sounds and looks delicious. What an amazing meal and how wonderful that all of your family were involved preparing it. I bet you all were pretty full after consuming everything. I love the square plates too. Thank you! We were very full. I bought the square plates at Wegmans. 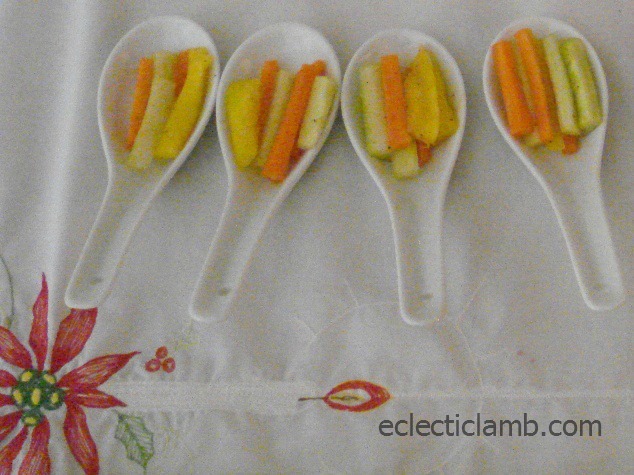 what a GREAT idea for a dinner party!! Love this! 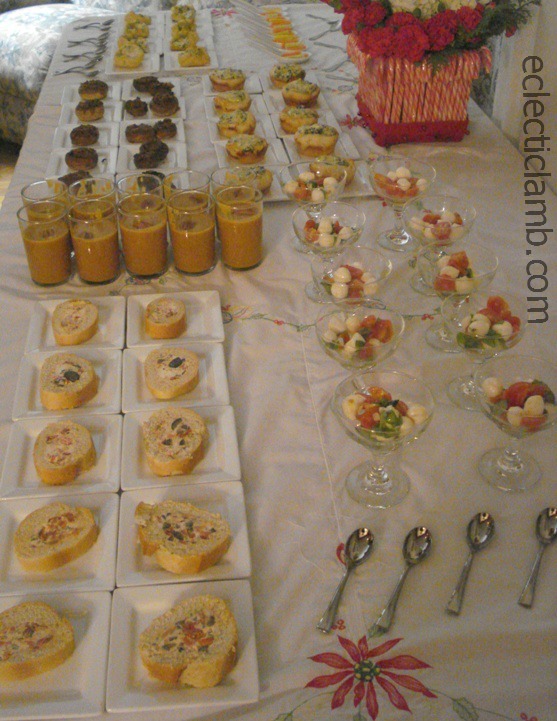 Have done all small plates at the holidays myself once and everyone enjoyed it so much! I think people stress themselves out more than necessary at dinner parties and these are all great ideas. Thank you so much! It was a memorable evening. Looks amazing! 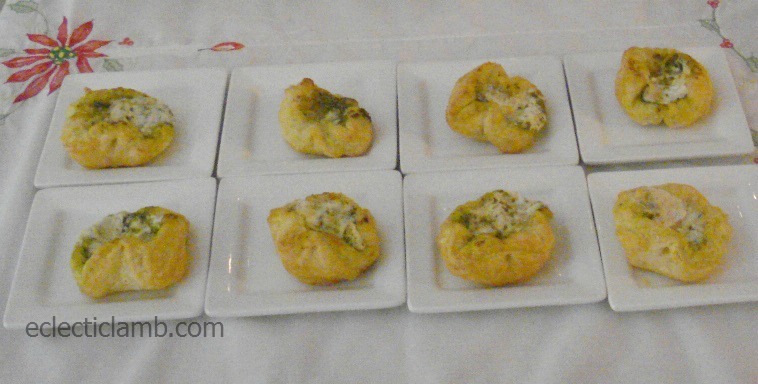 Great food, lovely presentation and that swan cream puffs are so pretty! 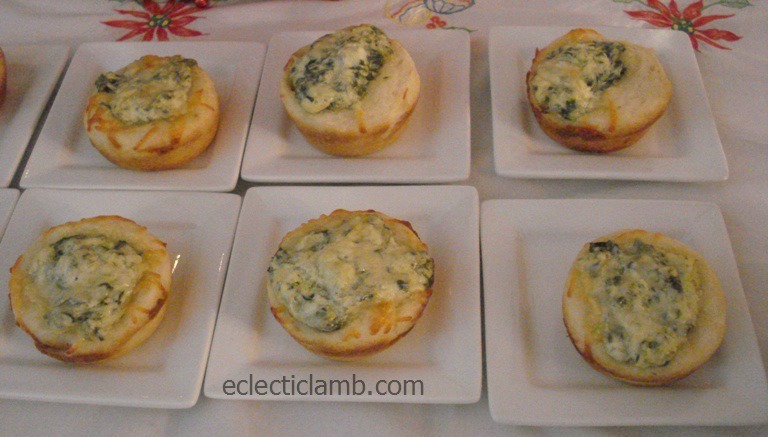 such a fantastic twist on the typical holiday feast! thanks for the inspiration!